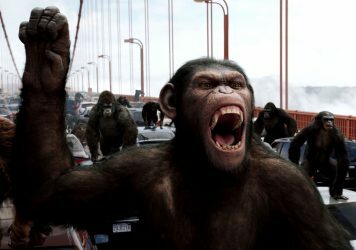 A trilogy capper for the Apes saga? Or a stopgap for further adventures? Faultless on a technical level. Shame about the sloppy storyline. Respect what this movie is trying to do more than what it actually does. Scowls! Scowls! We got scowls. 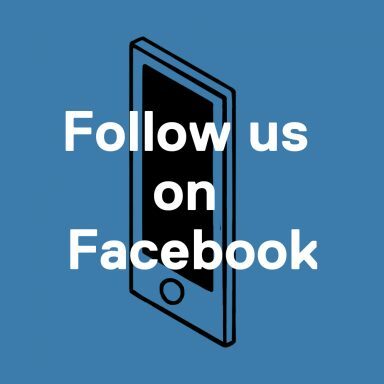 Get ’em here while they’re hot. We got big scowls, small scowls, wide scowls, intense scowls, melancholy scowls and angered scowls. We got those scowls with the ridged foreheads and pursed lips. We got full-cheeked scowl with the pained thousand-yard glare. We got the toothy scowl with popping veins and dapples of sweat trickling down the brow. We’ve even got – for one time only – the scowl coupled with real salt tears, the combined perfection of rage and sorrow. We got them all at the War for the Planet of the Apes store down on Hollywood Blvd. 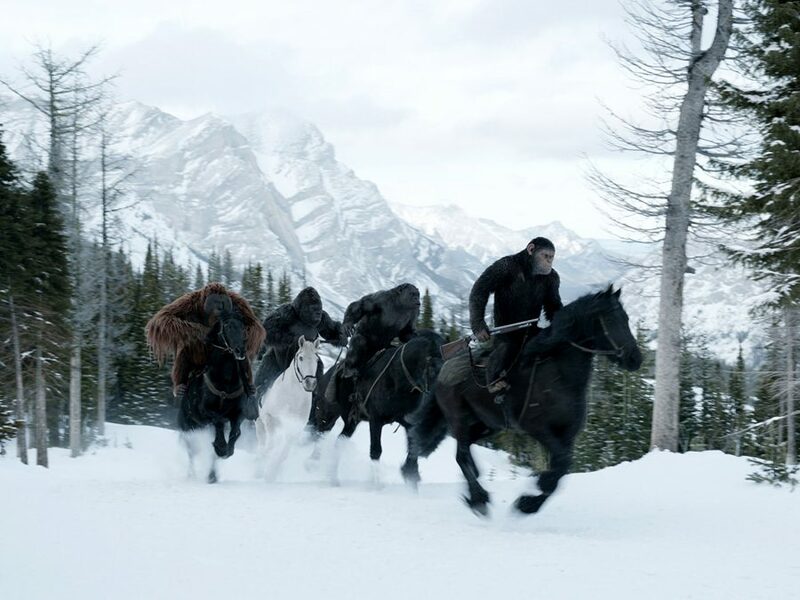 Yes, Matt Reeves’ War for the Planet of the Apes is a serious film about serious apes fighting for survival and attempting to wrap their ape brains around human nature in a number of highly serious ways. And they ain’t happy about it. 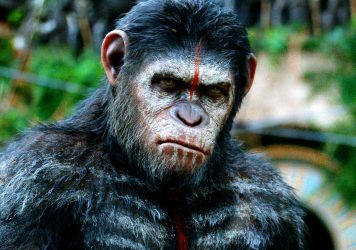 The story picks up from the previous instalment, 2014’s Dawn of the Planet of the Apes, and doubles down on the idea that the global hierarchy has shifted – now it’s the apes that we like and the humans we hate. The latter had their chance and they muffed it hard. They played god, and god rapped them across the knuckles. 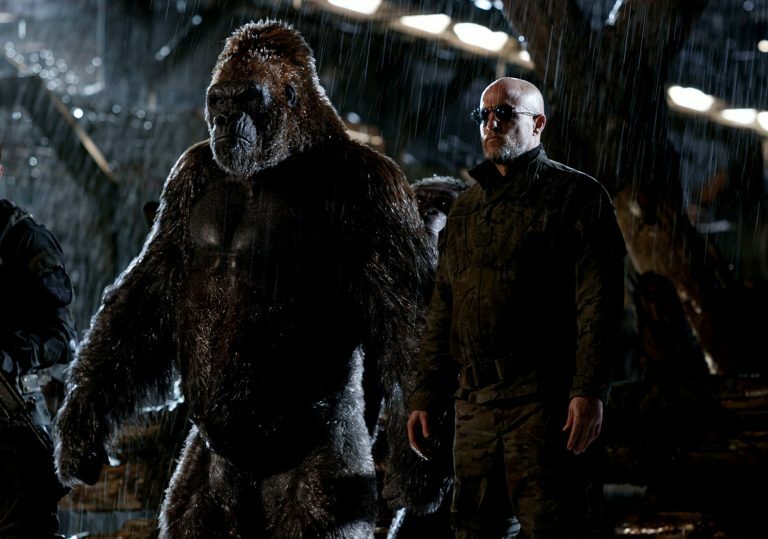 Ape leader Caesar (mo-capped to expressive perfection by Andy Serkis) is trying his best to curb the killing, offering his main human foe, Woody Harrelson’s ominous “Colonel”, olive branch after olive branch. The Colonel is having none of it. A gesture of peace becomes a sign of weakness, resulting in the massacre of Caesar’s wife and child. The talking ape messiah is now driven by the malevolent blood revenge he spent the entire previous film convincing his cohort, Koba (Toby Kebbell), to resist at all costs. He must go on a journey, and he must go alone, as only he can exorcise the ape demons locked within him. The intent of the film is noble, and even though the special effects exemplify the heady wonders of digital technology, there’s still something naggingly synthetic about it all. It’s hard to imagine how these semi-humanoid apes could look more real, and each close-up of an ape face offers a mind-warping vortex of insane micro detail and wonderment. It’s the hairs, the follicles, the skin burnishes, the folds, the scars, they just look as close to reality as would be humanly possible. You look at these images and just see the vast teams of artists battling to render each frame as close to photographic perfection as they can. And yet, it’s a crying shame that these immaculate creations are served by a storyline which, in digital effects terms, feels about as real as The Lawnmower Man. As Caesar and his band of plucky cohorts tramp through snowy climbs in search of the Colonel’s secret lair, they stumble upon handy plot devices along the way. There’s even a random levity generator in the form of Steve Zahn’s lovable lummox, Bad Ape. When Caesar finally gets his one-on-one with the big man, Harrelson is given the dismal task of spouting dense exposition for five minutes straight. He does his best to inject a sense of urgency, excitement and rumbling gravitas into scads of bloated backstory, but it turns his character into a cold story mechanism. The film spends so much time trying to fool the eye, that it entirely forgets to fool brain. Its other problem is an awkward, smash-and-grab attitude to 20th century political atrocities which values brash, fun-size visual references above any more nuanced exploration. Sombre Holocaust iconography is mashed together with the nationalist hubris and folly of Vietnam which is then fused with the experience of American slavery and the devastation of the AIDS crisis. Which is all great, except that you’re spending the whole time wondering why the apes don’t just climb over the fences and run away from all the hate. It also makes some very cack-handed movie references, and for those unable to spot the parallels between Harrelson’s rogue military mad man and a similar figure from a 1970s classic, then it’s literally graffiti’d on a wall for you later on. Maybe it all comes back to the film’s muddled intent, a desire to make this more than just your garden variety effects blockbuster and leave a more profound impression. And while matters are palpably sedate and pointedly “emotional” between the opening and climactic brawls (with the focus trained on intellectual rather than physical clashes) the film never quite manages to realise its vaulting ambitions. This latest instalment in the Apes franchise, about the preservation of humanity, lacks any genuine human characters. We take an exhaustive look back at the ups and downs of this iconic movie simian. This unlikely reboot is a relatively modest B-movie bolstered by A-grade technical wizardry.